Astronomie - FERMI:Einblick in den Zustand des Kosmos vor 7000000000 Jahre. UNSW astronomers have discovered the closest potentially habitable planet found outside our solar system, orbiting a star just 14 light years away. UNSW Australia astronomers have discovered the closest potentially habitable planet found outside our solar system so far, orbiting a star just 14 light years away. The planet, more than four times the mass of the Earth, is one of three that the team detected around a red dwarf star called Wolf 1061. 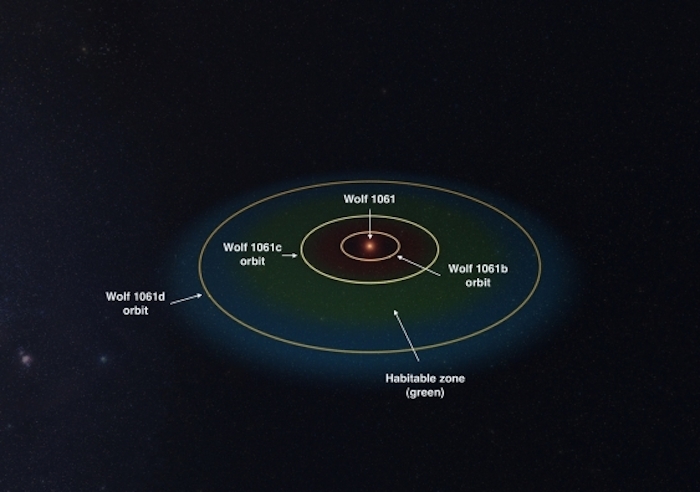 While a few other planets have been found that orbit stars closer to us than Wolf 1061, those planets are not considered to be remotely habitable. “It is a particularly exciting find because all three planets are of low enough mass to be potentially rocky and have a solid surface, and the middle planet, Wolf 1061c, sits within the ‘Goldilocks’ zone where it might be possible for liquid water – and maybe even life — to exist,” says lead study author UNSW’s Dr Duncan Wright. “It is fascinating to look out at the vastness of space and think a star so very close to us – a near neighbour – could host a habitable planet. “While a few other planets have been found that orbit stars closer to us than Wolf 1061, those planets are not considered to be remotely habitable,” Dr Wright says. The three newly detected planets orbit the small, relatively cool and stable star about every 5, 18 and 67 days. Their masses are at least 1.4, 4.3 and 5.2 times that of Earth, respectively. The larger outer planet falls just outside the outer boundary of the habitable zone and is also likely to be rocky, while the smaller inner planet is too close to the star to be habitable. The discovery will be published in The Astrophysical Journal Letters. The UNSW team made the discovery using observations of Wolf 1061 collected by the HARPS spectrograph on the European Southern Observatory’s 3.6 metre telescope in La Silla in Chile. “Our team has developed a new technique that improves the analysis of the data from this precise, purpose-built, planet-hunting instrument, and we have studied more than a decade’s worth of observations of Wolf 1061,” says Professor Chris Tinney, head of the Exoplanetary Science at UNSW group. 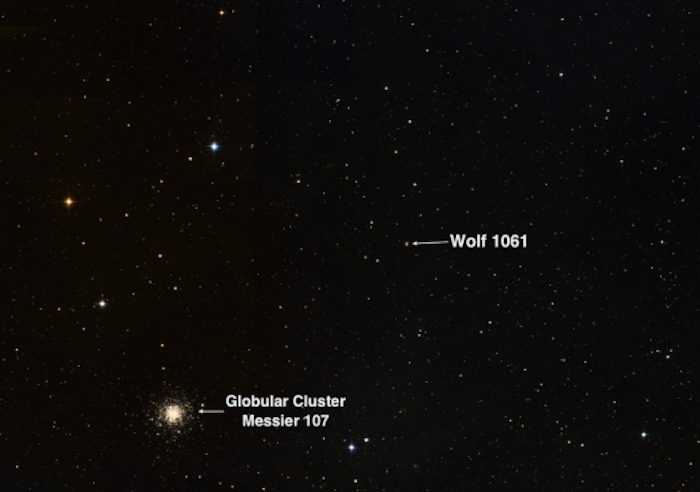 Wolf 1061 and its orbiting planets. The habitable zone is shaded green. Image supplied. “The close proximity of the planets around Wolf 1061 means there is a good chance these planets may pass across the face of the star. If they do, then it may be possible to study the atmospheres of these planets in future to see whether they would be conducive to life,” says team member UNSW’s Dr Rob Wittenmyer.